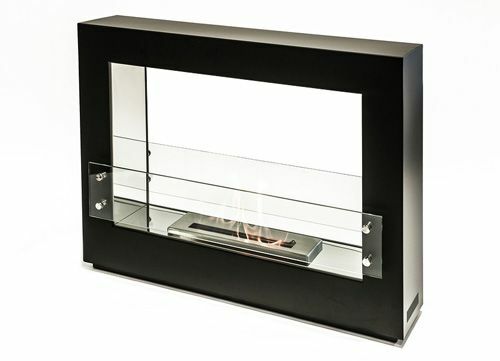 Bio Flame's Rogue 2.0 brings together a black stainless steel body with a 16 inch burner and 8 inches of tempered glass to create a fire that you can both see and feel. This free standing fireplace is not just a beautiful addition to any modern design, it's also an eco-friendly alternative to traditional fireplaces. All of Bio Flame's designs use their patented ethanol bio fuel that more environmentally friendly than natural gas, propane or wood. All Bio Flame products are manufactured in Canada. Can this unit be mounted into a wall? This can not be framed into a wall. What is the clearance requirements from the top/side for this model? Per the manufacturer, as this is a freestanding unit, it is zero clearance. Do the flames look "real" in this fireplace? How long does a can of the ethanol fuel last? The flame pattern of ethanol fuel does indeed appear very real. It is worth noting however that the flames appear more clear than other hydrocarbon fuels. This is common of alcohol based products, which can sometimes burn completely invisibly. The fuel tray burns for 4 to 6 hours, depending on the amount of fuel used.